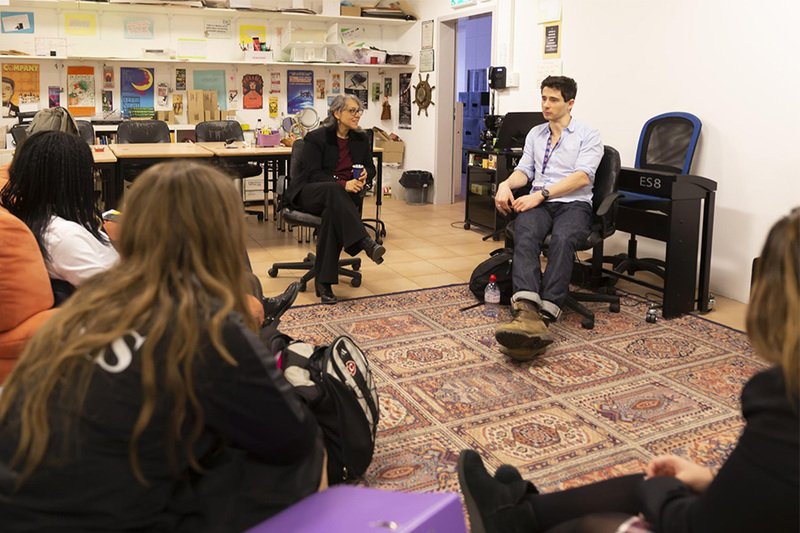 Highly sought-after screenwriter, playwright, and producer Michael Lesslie discussed his writing philosophy and circuitous path to success with TASIS seniors and guests in the Palmer Center on the evening of February 5. Mr. Lesslie, who hosted a conversation with students in Casa Fleming directly after his address (which can be viewed in full above), is the third distinguished guest to visit TASIS as part of the 2018–2019 TASIS Speaker Series. Over the course of his two days on campus, Mr. Lesslie visited Ms. Anna Kavalauskas’s IB Language and Literature class, Ms. Carolyn Rosenberger’s Introduction to Literature class, two of Mr. Peter Locke’s IB Language and Literature class, Dr. Chris Love’s World Literature class, Ms. Valerie Bijur Carlson’s IB Theater Arts class, and Ms. Andra Yount’s British Literature class while also leading a joint session in the Palmer Center with students from Ms. Rosenberger’s and Dr. Love’s Introduction to Literature classes. "Mike is naturally inquisitive and personable, so it was lovely having him on campus,” said Mr. Locke, who chairs the TASIS Speaker Series (TSS) Committee. “But I was most impressed with the way our students interacted with Mike during his visit. Far from asking questions about the celebrities (many very famous ones!) he's worked with, they really interrogated him on his craft and how he takes a story from an idea to the screen." Mr. Lesslie’s impressive resume includes writing the script for Justin Kurzel’s 2015 version of Macbeth, and he is now writing a contemporary screenplay of Hamlet—starring Riz Ahmed—for Netflix. 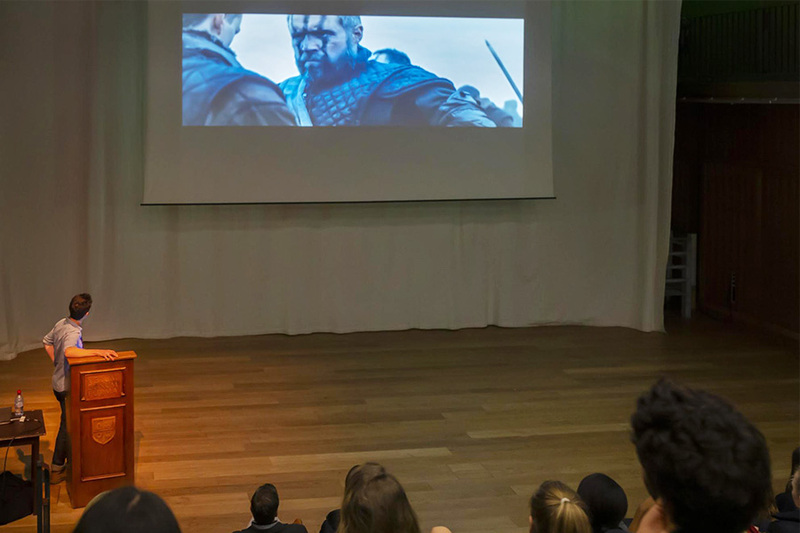 His visit was particularly well-timed for students in IB Language and Literature, Introduction to Literature, and World Literature, who are currently reading The Merchant of Venice, Julius Caesar, and Macbeth, respectively. An Oxford University graduate with double First Class Honours in English Language and Literature, Mr. Lesslie began his writing career at age 23 with Swimming with Sharks, a play that opened in the West End starring Christian Slater and Matt Smith. The same year, he wrote a BAFTA-nominated short film, Heavy Metal Drummer. He continues to balance playwriting alongside screenwriting and has had his work staged in theaters and screened in cinemas across the world. Mr. Lesslie wrote the script for Assassin’s Creed (also directed by Kurzel and starring Michael Fassbender) and has worked closely with acclaimed filmmakers Doug Liman and Johan Renck. He is currently adapting and executive producing the six-part miniseries The Little Drummer Girl by John Le Carre for the legendary Park Chan-Wook, which AMC and the BBC began screening in 2018. He also works as a producer with his business partner PJ van Sandwijk and their company Storyteller Productions. Storyteller’s first feature documentary film, the iconic director Errol Morris’s American Dharma, premiered in 2018, and several more high-end film and TV projects are at advanced stages of development and production. The TASIS Speaker Series (TSS), formerly known as the Senior Humanities Program (SHP) and renamed in 2018 to more accurately reflect its present purpose, draws from five fundamental elements of the TASIS identity—truth, goodness, beauty, international understanding, and humanitarian action—to provide TASIS students with a signature educational experience. The TSS Committee, chaired by High School English teacher and Associate Dean Peter Locke, selects four speakers each year who embody the pillars of the program—with priority given to speakers who fulfill those virtues in some capacity. The Committee strives for a variety of voices, backgrounds, and professions represented in each year’s group but ultimately selects speakers on the basis of their ability to enhance the intellectual and moral experience of the outgoing seniors and the community as a whole. 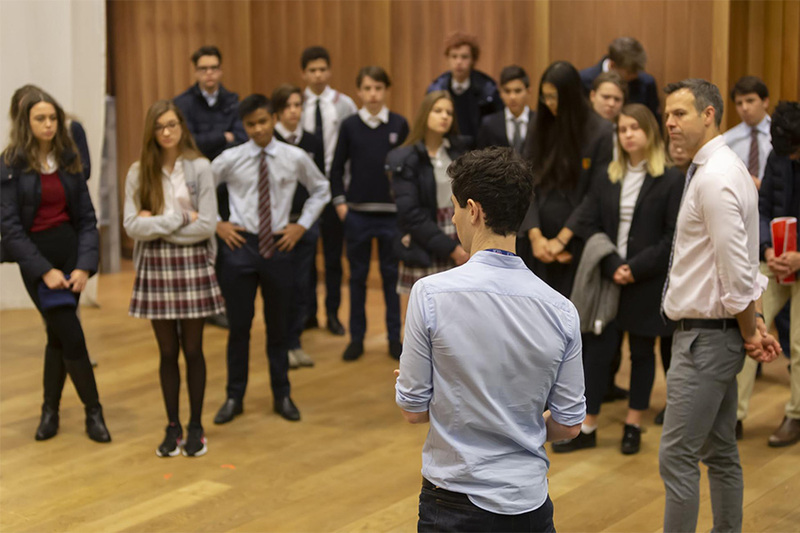 Although the TSS focuses on students near the end of their TASIS careers, the program aspires to serve as an educative instrument for the entire division, creating opportunities for all High School students to interact with people and ideas of significance that are concerned with the world beyond the TASIS campus. Students enhance their intellectual experience through discussions, lectures, class visits, and film screenings centered on some combination of truth, goodness, beauty, international understanding, and humanitarian action. Above all else, the program conveys a clear message to students about what the School hopes for and expects from them after they leave TASIS.